The Doors were an American rock band formed in 1965 in Los Angeles, California, with vocalist Jim Morrison, keyboardist Ray Manzarek, drummer John Densmore, and guitarist Robby Krieger. The band took its name from Aldous Huxley's book The Doors of Perception,the title of which was a reference to a William Blake quotation: "If the doors of perception were cleansed every thing would appear to man as it is, infinite. "They were among the most controversial rock acts of the 1960s, due mostly to Morrison's wild, poetic lyrics and charismatic but unpredictable stage persona. After Morrison's death in 1971, the remaining members continued as a trio until finally disbanding in 1973. 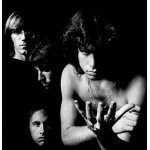 Although The Doors' active career ended in 1973, their popularity has persisted. According to the RIAA, they have sold over 35 million albums in the US alone.The band has sold nearly 100 million albums worldwide.Ray Manzarek and Robby Krieger continue to tour as Manzarek-Krieger, performing Doors songs exclusively. They were the first American band to accumulate eight consecutive gold LPs.Three of the band's studio albums, The Doors (1967), Strange Days (1967), and L.A. Woman (1971), were featured in the Rolling Stone list of The 500 Greatest Albums of All Time, at positions 42, 407 and 362 respectively. In 1993, The Doors were inducted into the Rock and Roll Hall of Fame.